Length measurement: is mainly used for the continuous production of textiles, foils, tubes and other products. The basis of the measuring device is the length sensor , which works on the rolling principle when the measuring wheel is rolled over the surface of the product. Another part of the length sensor is the incremental sensor at the output of which is available electrical impulses that are fed into an electronic pulse counter. Counter contains a multi-digit LED or LCD display and controls for resetting the display or setting the counter parameters. Sensors and length meters are equipped with a metal fastening arm. Standard length meters use precision measuring wheels with a 500 mm circumference. Length meters are manufactured in a wide range of configurations and, if required, it is possible to manufacture the device according to customer requirements. The length meter is uniformly powered by a 230V/12V AC adapter. The length meter can be powered directly with a DC voltage in the range of 8 to 30V. Resolution: Measurement units are either in cm or in mm. 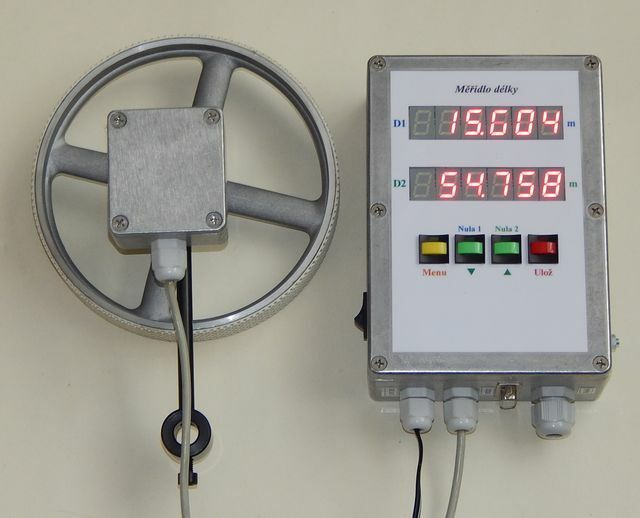 Unidirectional meters are always in cm. Bidirectional meters have a resolution in mm, but the resolution in cm can also be selected on the display. Display Type: The basic types of displays used are the 6-digit LED display with 14mm characters and a two-line LCD display with 2 x 8 characters. Outside of these types of display, LED displays with 20, 25, 38, 57, 100 and 125mm characters are available. All meters with a 1mm resolution can add and read the measured length. The measurement algorithm excludes random pulse counting if the wheel is standing. Even if the wheel vibrates, the impulses are added and subtracted as they are and the measurement is still accurate. Guaranteed measurement accuracy is 0.25%. (This is an accuracy sufficient for business measurement). The DELK2191 measurers have an adjustable calibration constant, and self calibration can also be done. 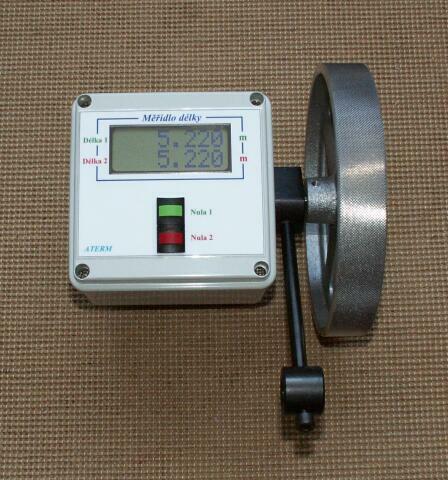 DELK2131 length meter allows bi-directional measurements with a range of -999.999 to 9999.999m. The LCD has two lines of eight characters. The display shows two values of the measured length, and each can be reset by a separate button. Therefore, one of the measured values can be used for the total measurement, for example by zeroing it at the end of the shift, while the second value is reset at each measurement of the measured material. The device is equipped with a rechargeable battery that can be recharged using a network adapter. The battery charge time is approximately 40 hours. Charging time is 12 hours. It is also possible to operate with a power adapter when the battery is kept in a charged state. Length meter DELK2191N is wall mounted with a separate sensor. The meter includes a two-line LCD backlit display with eight characters to display the measured length and four control buttons. The meter is equipped with two presets with output relays, with the option of using one of the piece counting preferences. Other parameters include the Correction Coefficient for correction of measured length, Pulse Adjuster (Forward / Reverse), optional Measurement Range (cm / mm), and display Illumination Control. All these parameters are set using the control buttons. Two values ​​of the measured length are simultaneously displayed on the display. Each can be individually reset. One of the measured data can be used, for example, for the aggregate measurement of the length and the second for the partial measurement of the length. When using the Pieces parameter, the length of the upper line of the display is the number of pieces and the lower line of the display. The meter is powered by a tightly connected 230V / 12V mains adapter. In the basic version, the device is delivered without a communication interface, but can be equipped with an RS232 or USB interface . An interface meter delivery is a PC software (Windows) that allows you to read and reset the measured length via the communication line. There is also a version of the DELK2191NS metal length meter that has higher mechanical and electromagnetic resistance. 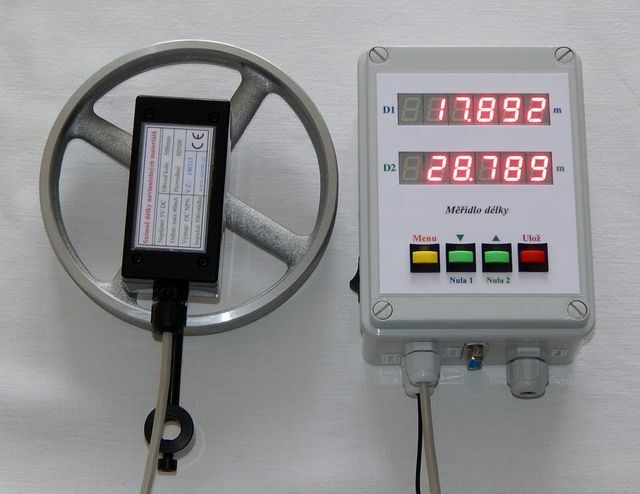 This type of meter is therefore designed for industrial plants with higher levels of electromagnetic disturbance.